Peace and tranquility at St. Ives! 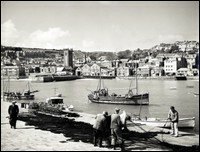 Being a charitable organization the St Ives Archive plays a major role in the community. It works closely with the local schools, colleges and other educational establishments and has links with libraries, museums, art galleries and archives in the area. St Ives Archive welcomes printed material of all kinds concerning St Ives and its inhabitants. It also promotes special projects, including exhibitions, lectures and the recording of reminiscences from the public to supplement the written material. The Archive, which opened in 1996, holds information on every aspect of the town and surrounding area in newspaper articles, maps, legal documents, correspondence, catalogues and books. It has an extensive collection of photographs which have been taken over the past one hundred and forty years. These clearly document how the area has changed over the past century. Copies of many of the images may be purchased. This archive entry was last updated on 21 March 2017. Information incorrect or out-of-date?